Many of our guests favour the cheap air travel from the likes of Ryanair and Easyjet, this is now the ‘default’ method of travel to ski and snowboard resorts for many people. For information on our NEW and VERY COMPETITIVE €99/ approx £88 RETURN shared transfer service to/from Geneva Airport provided by Simply Transfers see the Airport Transfers page. For arrivals into other airports, such as Lyon, Chambery or Grenoble, or outside of the times above, and for larger groups that can fill a mini bus, it can be more convenient to arrange a private transfer. Cool Bus run by Rob and based in Bourg St Maurice are a reliable and friendly company that serve our resort. Subject to availability Cool Bus offer Chardons guests a preferential rate, so contact Rob and don’t forget to let him know you are a Chardons guest. If, as sometimes happens in busy periods, air fares become very expensive, it may well be worth considering other options. Rail travel from London is a good alternative once the price of a plane ticket rises much above £200. 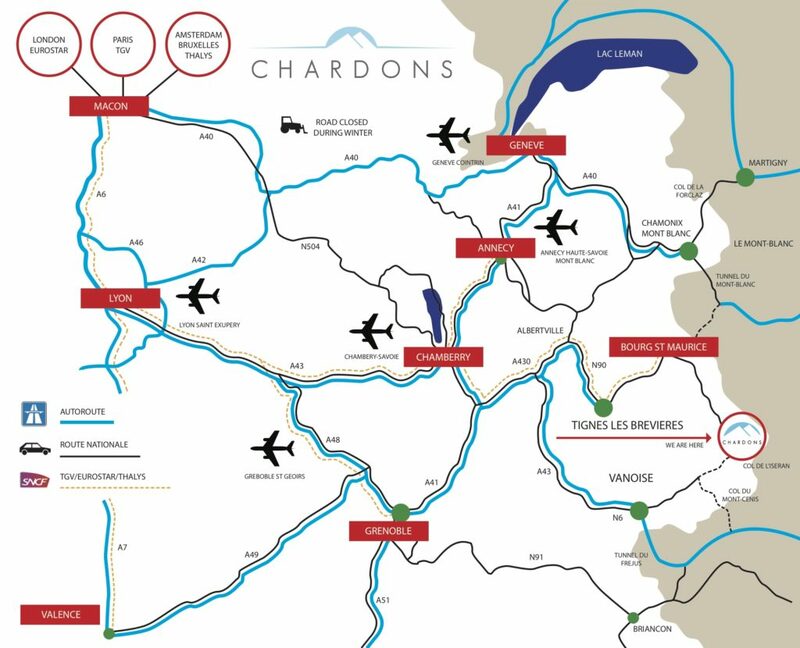 An interesting new website called Snowcarbon.co.uk provides very comprehensive information on getting to Tignes from the UK which can be quicker and cheaper than more traditional air routes. A direct link to the Tignes page is here. Coach travel is a similarly good method of travel for the budget minded. Snow Express are offering a service from London to Tignes at very competitive rates and the website is good and easy to use. Finally, car travel is still a good option if you have several people to split the driving, fuel and tolls. Normally the roads are gritted and cleared all the way to our ski hotel in Tignes and if you are unlucky and arrive during a snowfall (or lucky depending on how you view it! ), chains can be purchased at the large supermarkets in the valley very cheaply. VERY IMPORTANT – The Cormet de Roselend mountain col leaving Albertville running over to Bourg St Maurice via Beaufort, and the Petit St Bernard mountain pass from La Thuile in Italy running over via La Rossiere are both shut from late October to at least June. DO NOT TRY TO COME THROUGH THE MONT BLANC TUNNEL to get to Tignes as you will not be able to get across from Italy as the mountain pass will be closed. DO NOT RELY ON SATELLITE NAVIGATION systems in the winter. They often indicate you should drive over a high pass which will be closed. The systems do not yet update whether a high pass is open or not. You have been warned! Flying to the French Alps has become much more popular with the cheap carriers such as Easyjet and Ryanair. Les Brévières ski resort is about a three-hour drive from either Geneva or Lyon airports, or a three-hour direct bus transfer. Prices start from about £100 return with Easyjet or Ryanair. Remember that these cheap carriers always get more expensive the later you leave your holiday booking. It is worth checking the cost of ski and snowboard carriage on your preferred airline as this can hugely increase the final cost of your flights. Many guests find it cheaper and easier to leave their skis at home and take advantage of our discounted ski and snowboard hire at Chalet Chardons, saving them the cost of the airline equipment carriage and the hassle of carrying their skis from the airport to Tignes. The Skyscanner website is extremely useful for finding cheap flights in one place from all the major budget carriers. For information on our NEW and VERY COMPETITIVE €99/ £88 RETURN DIRECT transfer service from Geneva Airport see the Airport Transfers. For larger groups, it can be cheaper and more convenient to arrange a private transfer, Cool Bus are a reliable company that serve our resort (for a quote go to Cool Bus) or Mountain Rescue are another English-speaking transfer company (for a quote go to themountainrescue.com). Please bear in mind though that you will not be met by a Chardons representative on these journeys. Booking in advance via any of the links below is generally recommended. Don’t forget to specify snow chains and roof racks if you want them as the hire companies will not automatically give you a car with winter tyres. Roads are generally free of permanent ice from February onwards, but don’t forget that you still have to drive up the hill if it is snowing when you first arrive. Snow chains can be bought cheaply in Bourg St Maurice if you need them. Searching the internet for bargain car hire companies (often located in the USA) who book for you will often result in sizeable savings over reserving through the hire companies own websites. Getting here by train is a great way to maximise your time on the slopes. With the overnight services you can arrive in resort on Saturday morning and leave late evening the following Saturday, giving you 8 full days of skiing and snowboarding. Eurostar operate a service from London St Pancras or Ashford International to the French Alps every Saturday from mid December to mid April. Several travel options are available from the high-speed direct link to the Alps on Eurostar or a change in Paris to the French overnight service with couchettes. The train arrives at Bourg St. Maurice and from there it is a 20-minute taxi or bus ride to Les Brévières. Eurostar prices are around £199 return. Bear in mind when comparing prices with airfares, you will not have to pay for a transfer from the airport to Tignes and back. An interesting website called Snowcarbon.co.uk provides comprehensive information on rail travel. VERY IMPORTANT – The col from Albertville running over to Bourg St Maurice via Beaufort and the col from La Thuile in Italy running over via La Rossiere are both shut from late October to at least June. DO NOT COME THROUGH THE MONT BLANC TUNNEL to try to come to Tignes. See the warnings at the top of the page. It is generally unwise to rely on Satellite Navigation in the mountains as (so far) these units do not include information on which roads are closed during the winter. New motorway links have made driving to the French Alps quite an attractive proposition over the last few years. The journey takes 10 to 12 hours from Calais. As of the last couple of years, there has been an unfortunate push towards speed restriction based road safety systems that British drivers will be familiar with from the UK. As is often the case, the cameras have been sited for maximum revenue production on fast straight stretches of roads rather than outside schools and hospitals where they would actually save lives. This has meant quite a few speed cameras on some motorways, and particularly around towns and ring roads. The new road safety culture has also led to an unfortunate increase in aggressiveness and self-importance from the French Motorway police should you get stopped. Whilst the situation is nowhere near as bad as on UK roads, we would advise drivers to be aware that things may be changing – largely for the worse as France is a big country and the probable effect of sitting for 12 hours at an interminable 80mph on deserted roads is a huge increase in the risk of falling asleep at the wheel. Having said this, unless you are really pushing it, we have had no reports of overly excessive policing apart from around big cities like Paris and Lyon. The Speed Cameras are preceded in France by a big sign saying ‘Pour votre securite controles automatiques’ and a picture of a radar. Amusingly, many of the poorly sited cameras seem to have attracted the attention of the hunting community and have been used for target practice. The fine system doesn’t seem to tie up with the UK one at present though this could change in the future. Be VERY careful on the road into Moutiers. It goes from a fast two lane road to a slightly more twisty fast two lane road and the police are there nearly every Friday and Saturday with a speed gun and a book of 90 euro fines. The limit here is 90kph. You should go slower from 5km BEFORE Moutiers on the RN90 from Albertville, just after you go past the turn for ‘Grand-Coeur’. On the way out of Moutiers the big tunnel has a speed camera right in the middle of it and the limit is now a ridiculous 70kph on what is essentially a motorway. Lots of cars realise the camera is there at the last moment and slam their brakes on right in the middle of the tunnel creating obvious hazards. Be careful. Apart from the cost of the ferry or tunnel, you should allow about £100 in petrol and £80 in tolls each way to/from Calais. A coach service operating from London to Tignes has a good website and attractive prices or around £70 one way and £130 return. The service is operated by Snow Express and seems to offer excellent value for money and quite competitive journey times if you allow for the lengthy process of security checking now common on airlines plus the time taken to transfer to the airport at each end. It is almost certainly cheaper than a combined flight/airport transfer. When you get into the village, walk along the main road till you get to a big Intersport ski shop on your right, opposite the little Sherpa supermarket. The main door to Chalet Chardons Hotel is on the right of this shop, or go round the back and up the stairs over the Moose bar to find the back entrance. 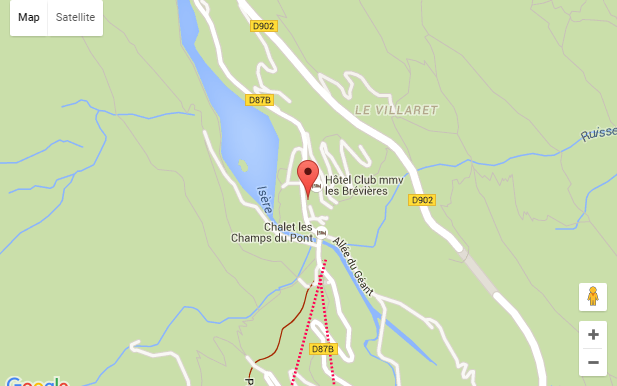 Click here for a village map of Les Brévières skiing and snowboarding resort.